Since the University of Virginia Library became a partner in Google Book Search, we've gotten lots of questions from staff and community members about the project. This is, of course, an interest the Library encourages. So the GBP team decided to create an exhibit to explain how Book Search works, as well as how it fits in with the Library's history of implementing digital projects, a priority for us since 1992. The exhibit, running now, is located near the main entrance of Alderman Library, the main library at the University of Virginia. 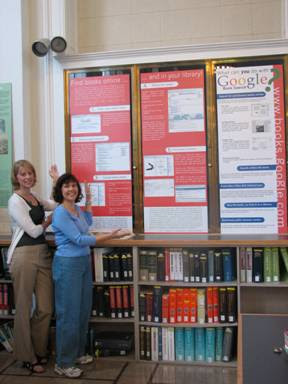 We're delighted that this project is helping to make the Library's resources discoverable by people everywhere, and we hope this display will generate even more interest, enthusiasm, and understanding of Google Book Search.